Chicago Police Officer Jason Van Dyke shot 17-year-old Laquan McDonald 16 times, and every second of that fatal shooting was recorded by a police car dashboard camera in the middle of a Chicago street. That video has been broadcast countless times, showing every twitch of the body and what appear to be puffs rising from McDonald’s body as bullets strike. 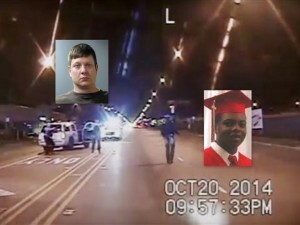 Chicago police officer Jason Van Dyke and Laquan McDonald. It’s gruesome, but it shows exactly what happened. The video is compelling evidence to disprove early police accounts that McDonald, who was black, was walking toward police with a knife in his hand and menacing police. The video indicates that McDonald was walking away from police when Van Dyke, who is white, opened fire with a barrage that caused McDonald to twirl around, drop on his backside and roll to his right. Van Dyke kept shooting as McDonald lay in the street Oct. 20, 2014. An autopsy confirmed that McDonald was shot 16 times. Van Dyke was indicted on six counts of first-degree murder and one count of official misconduct. Police misconduct in shooting deaths in the United States is a major story propelled by television, a visual medium. The use of phone video or dashboard cameras are recent developments that make it possible to show what happened, rather than rely on police or witness accounts. Technology is playing a bigger role in proving guilt or innocence. But how many times is it necessary to show McDonald striding toward police, then falling to the ground as Van Dyke shoots him? Sometimes the whole scene is broadcast, sometimes it is edited so that it shows McDonald walking toward police. Stories like the McDonald shooting show “why 2016 should be the year of engaged ethics,” according to Kathleen Bartzen Culver, an assistant professor in the University of Wisconsin’s School of Journalism and Mass Communication. Culver said she was especially impressed with the way KUSA-TV in Denver covered the fiery crash of a Flight for Life helicopter, killing the pilot and burning two passengers. Clearly, any newsroom discussion of sensitive video should determine how to use it, or whether it should be used at all. The Ventura County Star, a daily newspaper in Camarillo, Calif., refused to use video of a fatal shooting on its website in December 2015. In video taken on a woman’s cellphone, a Ventura County sheriff’s deputy shoots and kills a young man in a confrontation on a busy street. The use of video on conflicts has become so widespread that human-rights group WITNESS has issued ethical guidelines for using witness videos in reporting and advocacy. The New York-based group trains people using video in support of human rights. Its guidelines are intended for use by investigators, journalists, advocates, archivists and others who use video for reporting, investigating or documenting human rights issues. Deciding how to share footage publicly is rarely a simple process, said WITNESS. Among the issues raised in the 26-page document are consent; safety,dignity and privacy; risks and creating standards for individual organizations. This is not the first time Ethics AdviceLine has raised the issue of how far to go with graphic details of deaths. Here is a post on a controversy in 2013 about graphic reports of a British soldier hacked to death. Would you agree that showing the point of death in videos is unnecessary? In an editorial conference, what would be your best argument for handling sensitive video, both now and in the future? Is there a point at which repetition damages the reputation of a news organization? How much is appropriate to repeat as the story continues? Give your thoughts below in the Leave a Reply box. Professional journalists with questions about ethics, call 866-DILEMMA. Or go to ethicsadvicelineforjournalists.org.